"I just want to thank you again for the puppy. She is an absolute angel, and she is already very potty-trained surprisingly. She knows that she is supposed to go outside already. Did you guys start potty-training with the pups, or is she just quicker than usual. I don’t remember my last shepherds picking it up this quick. We named her Lucy by the way (not sure if we mentioned that), and she is everything we wanted in a puppy. " "I love him and he his smart as hell, I entered him in puppy kindergarten and took him to the vet got done what needed to be done he is my heart !!!!!!!!!!!!! " Just a quick note to let you know that both puppies arrived safe and sound Thursday in Manchester NH. They are beautiful little guys. The 'blue one' is named Duke and he is David & Dawn's puppy, the 'black & tan' is named Charlie and he is ours. I attached a few photo's for you. They went to their first school baseball game today and they were a big hit with the team and the fans. I'm a big scrapbooker and am working on their first page. We moved from Minnesota to Pilot Mound, IA. I will still be raising quality German Shepherds in our new location. "Omg,.what a smart,.well-socialized, confident puppy we got from you! If I had to describe the perfect temperament for a shep that will be with the public every day this is it! Thank you!!" The first pup we sold her (roughly 10+ years ago) raised a bear and this pup, I hear, will raise a couger. This will make number six of our German Shepherds for Peggy's family. Good Luck Peggy!! "The blue shepherd we got from u comes to work with me every day. He and the black one from your Mom work with kids. The male black and tan is a home body, complete couch potato. The female blk and tan from that litter belongs to my daughter and does everything from herd sheep to therapy dog. The latest female blk and tan is at work as well, and guards the young lady who lives there. We love your dogs!!! "I've passed on your name and website to a couple friends that are thinking about looking for a puppy, including my parents and brother! But I thought you'd like to see some recent pictures of Jordy! We are now starting his intermediate puppy classes with the trainer that will do the PSA training with us! His name is Lucas, awesome guy! He actually knows Jordy's father, has worked with him in the cities before. Told me that he is a Czechoslovakia German Shepherd which I guess according to him is a very strong blood line! So I was happy to hear that! But Jordy is doing great! Too smart for his own good. At 9 months now he is about 80 lbs. The vet thinks he'll get to about 125 or so, can't wait!" I totally forgot to email you back! I'm so sorry! i found the paperwork.. he hid it in Jordy's training folder... so I do have it... On another note I should let you know how he's doing!!! He had a great first birthday! I think he got more birthday wishes on Facebook that I did this year! But he's all the way through advanced training classes and we have actually begun his search and rescue training. This spring we will start his protection training (we want to wait till he's at least 18 months) so he'll start his shutzin level 1 in June and his narcotics training. Most of this training is more just for fun for him. I've always been told a German with a job is a lot happier. So I want to challenge him! But I will be able to volunteer him for search and rescue cases if I choose to do so which I think is really cool. He also has his Good Canine Citizen award and is a certified therapy dog now. Obviously I do not know what the rest of his litter is up to but all I can say is I'm very lucky we got him.. He is so smart and we are constantly complimented on his markings and how well behaved he is! He is about 85 lbs now at a year. The vet thinks he'll be about 125 when he is fully grown. So thank you again! Couldn't ask for a better pup! Hi, this is Gina I drove from Wisconsin last year and got one of your puppies a male named Busa. Just updating you on his health and well being. He is the greatest shepherd I have seen in some time. I have got many compliments on his body type and character. We are starting Schutzhund training this weekend and will be members of the Schutzhund club of America. We are hoping that we will title within the year. I just thought you would like to know that I would and have HIGHLY recommended you to people I have come across who seem interested in a well breed animal. He is spoiled and is doing what he loves ...and that is working he LOVES his obedience lessons. Check out the puppy page for pictures of the pups and story on the parents. For the most up to date information please check out our Facebook page at Lille's Puppy Pad in Iowa. I just wanted to let u know things r going great! I couldn't b happpier with Bear. Yes, Bear, it's not Buck, Bear kept slipping out so that name stuck! I am so glad we did the temperament test. Bear does little things everyday that encourage things for training all on his own. He's going to b a "natural" at being a service dog. Our family couldn't b happier with him! 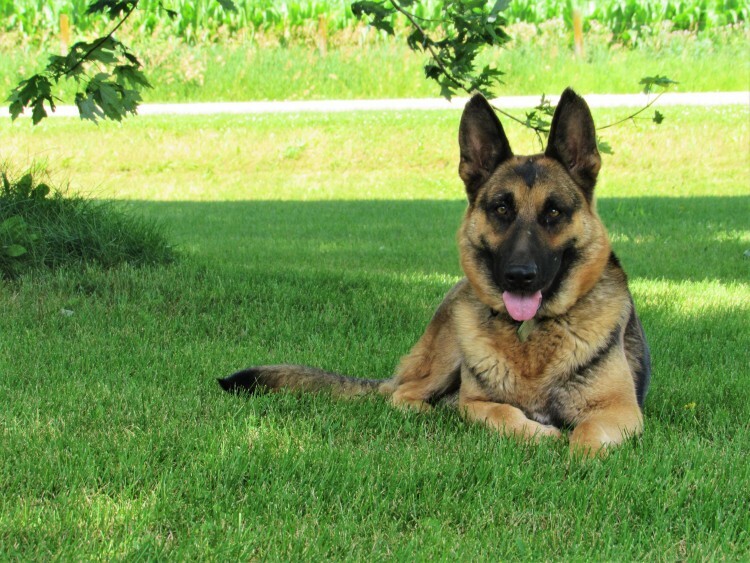 Raising quality German Shepherd for over 50 years. Located in Pilot Mound and Dayton, Iowa. Starting our third generation of proud German Shepherd owners, breeders, and handlers.